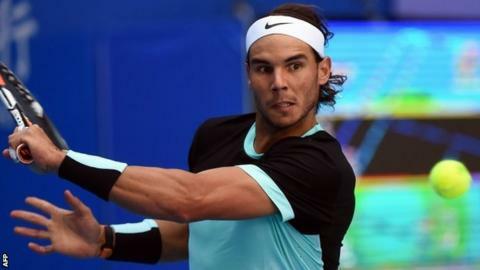 Rafael Nadal will face Novak Djokovic in the China Open final after the Serb beat Spain's David Ferrer 6-2 6-3. Nadal, 29, earlier reached his sixth singles final of 2015 with a 7-5 6-3 win over Italy's Fabio Fognini. Fognini had beaten Nadal three times this year, including the US Open third round, but the Spaniard crucially broke his serve at 5-6 in the opening set. "Happy to be back in a final. Thanks all for your support. Vamos," the 14-time Grand Slam winner tweeted. The semi-final featured six breaks of serve, five in the first set alone. In the second set, Nadal broke 28-year-old Fognini again to go 4-2 ahead and held out for victory. In Sunday's final, Nadal, whose world ranking has dropped to eighth, will be seeking a fourth trophy in a season in which he has failed to win a Grand Slam title for the first time since 2004. World number one Djokovic, 28, reached his sixth final in Beijing with a 73-minute straight-sets win over 33-year-old fourth seed Ferrer. In the women's semi-finals, Serbian sixth seed Ana Ivanovic, 27, lost a one-set lead over Switzerland's Timea Bacsinszky, 26, and crashed out 5-7 6-4 6-1 in the last four. Bacsinszky will meet this year's Wimbledon runner-up Garbine Muguruza, 22, after the Spaniard posted a hard-fought 4-6 6-3 6-4 victory over 26-year-old Agnieszka Radwanska of Poland. October 10 - Welsh sport's best day?